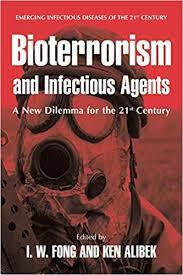 Research paper on Bioterrorism will look at the bioterrorism issue and assess its national security implications. This is a topic suggestion on Bioterrorism from Paper Masters. Use this topic or order a custom research paper, written exactly how you need it to be. This is a topic suggestion for a research paper on bioterrorism and national security in relation to combating terrorism. You may want to examine the U.S.’s policy toward the threat. Custom bioterrorism research papers are Paper Masters specialty. The thesis statement and topic you see here is just a sample political science research paper of what we can provide you in research. Papers are always original and we guarantee each research paper, essay, book report or term paper that is sold by Paper Masters will never be resold and is plagiarism-free. Health threats can even be conceived as an international or national security concern. Demographics and biological weapons are other ways of looking at health as security issues. The US and the international community are shaping new policies for dealing with these new types of security concerns. This research paper will look at the BIOTERRORISM issue and assess its national security implications. The essay will describe in detail how bioterrorism is our national security concern. Describe and discuss in detail how the US deals with this bioterrorism threat and what is/are our national policy toward bioterrorism. On March 6, 2002, Dr. Henry Kelly, the President of the Federation of American Scientists, spoke to the Senate Committee on Foreign Relations in response to remaining fears after the attack on the World Trade Center. The research question proposed by Dr. Kelly was whether America is adequately defended against further terrorist attacks. He proposes that the risk of radiological attacks on domestic soil is far greater than the risk of a nuclear explosion because radiological sources are in great number and are poorly guarded. Dr. Kelly perceives this topic as important because given the events on September 11, 2001, it has become necessary to consider that seriously evil acts can occur in America. These acts may involve any number of explosive devices or dangerous chemicals, but to protect innocent people, the government must consider all threats and search for ways to prevent further terrorist activity. Kelly’s study was unique because it implied that the government is overlooking dangerous radioactive substances while spending billions of dollars on the prevention of extremely unlikely nuclear events. This information is important to convey because people need to be aware that many different substances can be used as terrorist weapons, and that the government may be overlooking some potentially dangerous substances. Typhoid - Typhoid Research Papers custom written with bioterrorism issues discussed. How Society Depicts Arabs as Terrorists - Research Papers on Bioterrorism discuss national security in relation to combating terrorism. Domestic Terrorism - Research Papers on Bioterrorism discuss national security in relation to combating terrorism. Bioterrorism and national security research from Paper Masters. International Policy Issue - International Policy Issue Research Papers look at an example of an order placed on racial profiling and how it affects air travel. International Policies - Bioterrorism - Research paper on Bioterrorism will look at the bioterrorism issue and assess its national security implications. Cyber Terrorism - Cyber Terrorism research papers discuss the various techniques of cyber terrorism include the use of computer viruses, disruption of networks, and hacking attempts. National Security Agency - National Security Agency research papers examine the United States intelligence organization charged with the task of monitoring, collecting, decoding, and analyzing information from around the globe. National Security Council - National Security Council research papers examine a part of the Executive branch ,in the United States government, designed to advise and assist the President on national security and foreign policy. Paper Masters writes custom research papers on Bioterrorism and discuss national security in relation to combating terrorism.